"The Probability of Miracles" isn't an easy book to read, but it is an absolutely beautiful debut. 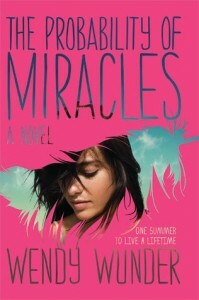 The story is about Cam, a seventeen year old girl with cancer. She's just been informed by her doctor that there's nothing else they can do to help her, that the best she can hope for is a miracle. Her mother, Alicia, refuses to give up, however, and soon they head off to Promise, Maine - a place that is said to be magical. Along the way they visit her grandmother and her best friend, Lily, who is also battling cancer. Although Lily and Cam speak daily, Cam finds herself dumbfounded when Lily reveals she's met a boy, Ryan. When Cam finds out Ryan has a girlfriend and he's messing around with Lily on the side, she flat-out asks if he intends on breaking up with his girlfriend for Lily. When Cam tries to explain to Lily what Ryan told her, Lily decides she wants nothing to do with Cam anymore. When they finally do reach Maine, Cam finds herself unable to believe in hope, love, and miracles - everything her mother and Lily want her to believe in. But when she finally opens up, she begins to rethink everything. I absolutely loved Cam. She's sarcastic. She's funny. She seems real. Everything that she goes through: falling in love for the first time (Asher), dealing with the loss of a friend, and accepting that her family's lives will continue without her - it all feels real. Same for the other characters. Each and every character in "The Probability of Miracles" is flawed, but that makes them more realistic. For example, Cam's mother, Alicia, isn't the perfect mother by any standards, but you can tell she loves her daughter and that she's terrified of losing her. That final scene between the two of them - it's a beautifully written moment. There are plenty of humorous moments through out "The Probability of Miracles", mainly thanks to Nana and Cam, but this isn't a happy story. It's a story about a young girl trying to experience everything life has to offer before it's too late. Expect tears when you finish. Lots of them.